Much attention has been given to how far west Buddhism extended in ancient times. The most westerly Buddhist monument that can be is the foundations of a large stupa in the south east corner of the ancient citadel of Khiva in Turkmenistan. Small communities of Buddhists may have existed beyond this but if they did they would have been insignificant, isolated and exceptional. We can say therefore that the outer edge of Buddhism in the west was what is now western Iran. But how far to the east did Buddhism spread its gentle and civilizing influence? To the outer islands of Indonesia, to Australia or perhaps beyond? In the 1920’s a superb bronze bust of the Buddha was found on Sulawesi, one of the larger islands that make up Indonesia. This is the eastern most point that any Buddhist antiquity has ever been found. There is, though, no evidence of an enduring Buddhist presence either on Sulawesi or beyond it; no ruined temples or monasteries, no inscriptions or references to it in the historical records. However, only a few hundred miles south-west of Sulawesi is the small island of Bali where inscriptional and literary evidence shows that Buddhism existed along side Hinduism for about seven hundred years. Indian merchants first arrived in Bali in about 200 BCE and it was probably these people who introduced Buddhism and Hinduism. A Balinese work of uncertain date called the Nagarakertagama by the Buddhist monk lists all the Buddhist temples in Bali, 26 altogether, and mentions that in 1275 King Kretanagara underwent a Tantric Buddhist initiation to protect his kingdom from an expected invasion by Kublai Khan. The island’s history is scant until 1343 when it was conquered by and absorbed into the Majapahit Empire of Java-Sumatra. Hinduism and Buddhism both re ceived state patronage although the type of Buddhism that prevailed gradually became indistinguishable from Hinduism. A Javanese Buddhist work from about the 12th century contains this telling verse. ‘The one substance is called two, that is, the Buddha and Siva. They say they are different but how can they be divided? Despite differences there is oneness.’ Clearly at the time these words were being composed some Buddhists were struggling to maintain the uniqueness of the Dhamma while others were stressing its similarity with Hinduism. Eventually in both Java and Bali the integrators prevailed. Incidentally, the phrase ‘Despite differences there is oneness’ (Bhineka tunggal ika) has been taken as the motto for the Republic of Indonesia. With the collapse of Mahapahit in 1515 and the ascendancy of Islam, Java’s old intellectual and religious elite, including the last surviving Buddhist monks and scholars sought refuge in Bali. In January 2004 I fulfilled a long-standing wish to visit the island that Nehru eulogized as ‘The Morning of the World.’ I planned to visit all the sights that other tourists like to see but my main intention was to search out the traces of Buddhism and find out something about Bali’s small Buddhist community. My first stop was the Bali Museum in Denpasar, the capital of the island. The older part of the museum was built in 1910 in the style of a royal palace and gives some idea of the artistic sophistication of the traditional Balinese culture. The exhibits on display in the museum reinforce the impression that the Balinese have an unusually highly developed aesthetic scene. The paintings, masks, pottery, wood calving and fabrics are superlative. In one room is a modest collection of Buddhist antiquities. These consist of clay votive stupas found at Pedgeng dating from about the 9th century and seals with the well-known Dhammapariaya on them. There is also a small collection of bronze images of the Buddha and various bodhisattvas. The captions on these exhibits gave little information about them and so I made an appointment to see the curator. He was able to give details about publications containing some details about the history of Buddhism in Bali but told me that no comprehensive account of it has ever been written. 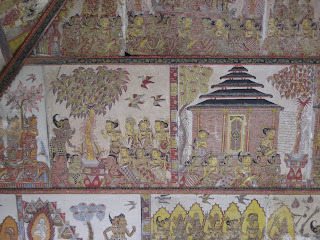 Next I headed for Goa Gajah near Ubud where I had read there were some traces of Buddhism. Goa Gajah was a sacred spring in ancient times and locals still come to bathe in its two pools. Water pours into the pools from pots held by beautifully calved figures of apsaras. Beyond the spring is a deep mossy and fern filled canyon with huge boulders strewn around it. The rocks on the side of the canyon have half finished Buddha statues, architectural forms and other things calved out of them. One bolder has what was quite clearly meant to be the pinnacle of a stupa calved out of it, again unfinished. There are also several artificial caves cut out of the cliffs one of which have three small stupas in front of it. The several inscriptions found at Goa Gajah show that both Hindu and Buddhist ascetics once lived here. My next stop was Besakih Bali’s largest and most sacred temple , which is situated on the lowest slopes of the spectacular Gunung Agung volcano. As the bus wound its way gradually upward the air became cooler and the landscape began to remind me of the country around Kandy, lush and green and filled with flowers. The top of Gunung Agung was hidden by cloud. Before the 10th century Besakih had been a Buddhist temple but just as Buddhism gradually declined and was absorbed into Hinduism so Besakih gradually became a Hindu temple. The temple itself is laid out in a series of terraces and extends for about a mile up the side of the volcano. I looked for signs of Buddhism, old statues or familiar motifs but could find nothing. Volcanic eruptions have destroyed or damaged Besakih several times throughout its history. Perhaps excavations in the thick black ash on which the present temple now stands would yield evidence of it’s Buddhist predecessor. My last stop was the eastern town of Klungkung which had been capital of a small kingdom during the 16th and 17th centuries. In the center of the town is Taman Gili (The Island Garden) the only surviving part of the old royal palace which was built in 1710. The ceiling of several pavilions in the garden are covered in paintings of the highest quality. Most of these depict incidents from the Tantrikatha, a Balinese version of the Thousand and One Nights, and the Hindu epic Mahabhatara. But there is also some 20 panels illustrating the life and adventures of a legendary Buddhist character named Satusoma. This is of course a retelling of the famous Sutasoma Jataka. The paintings depicting Satusoma’s deeds are full of action and drama and the legends about him are very interesting. Although my main intention in visiting Bali was to seek out traces of Buddhism I was very interested in seeing the many beautiful Hindu temples also. When I was at the Puseh Pura Desa Temple at Batubulan I chanced to see a line of images which included an elegantly calved one of the Buddha. Later in the temple at Pura Ulunsiwa I saw another statue of the Buddha still being worshiped. Hinduism first integrated Buddhism into itself and then erased its identity leaving only there two sad reminders. The last census in 1989 showed that there were 13,274 Buddhists in Bali, nearly all of them either ethnic Chinese or people from other parts of Indonesia. There are two Buddhist temples, one in Singharaj in the north of the island built by the Thai and Indonesian governments in 1971 and another in Denpasar. I visited both these establishments and was sad to see that the monks in them did little more than conduct rituals and do blessings for the people who came. I was invited to the homes of several Buddhists and was treated with the greatest respect but it was very clear that my hosts knew little about the Dhamma. They all acknowledged their ignorance and seemed to have a genuine desire to know more but as they all said, there was no one to teach them. But Hinduism in Bali is surprisingly vigorous and still claims the allegiance of almost everyone, young and old. It seems unlikely that the teachings of the Buddha will prove to be attractive to the Balinese for a long time in the future. What a tour de force! Special appreciations for the photos. The paintings of Sutasoma are particularly moving. You have a impressive very blog. Bhante, your curiousity about Buddhism's origin and history, and travels to learn more is a joy! I never miss reading your blog! Thanks so much for taking the time. If you get the chance a visit to Borobudur on Java is well worth the trip. It's well to go early in the morning to see this monument before the teeming crowds descend on it.